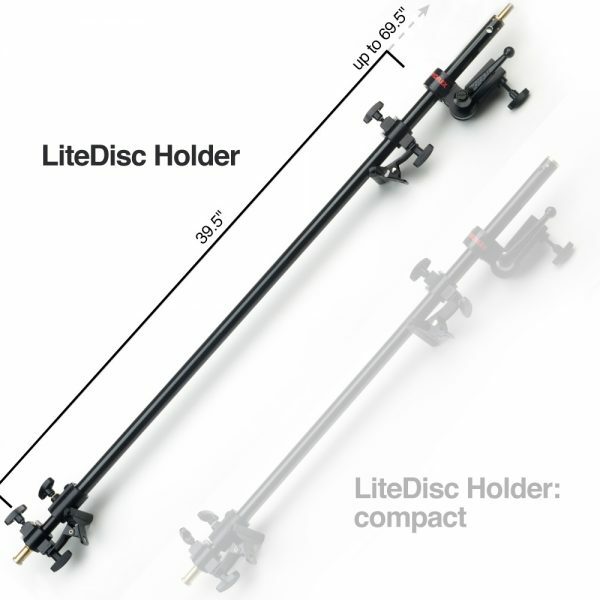 Our heavy-duty all-aluminum LiteDisc® Holder provides the support you need to hold and position all sizes of LiteDisc® and MultiDisc® reflectors. Also supports many other types of materials such as foam core, plexiglas, cardboard, etc. The two-piece extension is adjustable from 39-70 inches and can be rotated and swiveled for precise positioning. Rubber grips on the clamps protect your reflector and the clamps can be rotated to hold your reflector from the top or side. This is useful when using a translucent reflector that you don’t want the shadow of the LiteDisc® Holder across the middle.